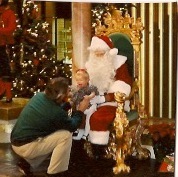 Oh, the excitement of sitting on Santa's lap... Let's walk through the steps of wonderment together, shall we? 1. Get children dressed in cute outfits, force coats, hats and mittens all to the dismay of the children who want nothing to do with said outerwear. 2. Drive to the mall... is there anything worse than the mall? At this time of year? 3. Stand in a mile-long line with many aggravated children anticipating the horror that lies ahead.... Santa. 4. Upon reaching the end of the line, and after paying in advance for your Christmas Photo with Santa, hand your child over to the attendant, elf, high school drop out, whatever you want to call them, to deliver to the lap of Santa. 5. Watch your children as they realize the terror that has become their life, beg them to smile for the camera, realize after some bribing they aren't going to smile, rescue them from the disaster. 6. Wait 15-30 minutes for the photo which you were required to pay for before realizing the reality of the smiling situation. Here are photos of my husband and I with Santa, both at age 2.... I appear to be dealing with the horror better than he, although I don't seem particularly thrilled about the situation... It seems that my husband may have been coaxed with some sort of stuffed animal... to no avail... Santa looks to be using a significant amount of force in keeping him seated. At least my Santa looks gentle. this may be my favorite post so far..
Hysterically funny. I never subjected my children to this horror. One less scar with which to grow up. I am so laughing!!! Thanks for the giggles, wonderful post! why do we do that to our children? And why am I laughing? 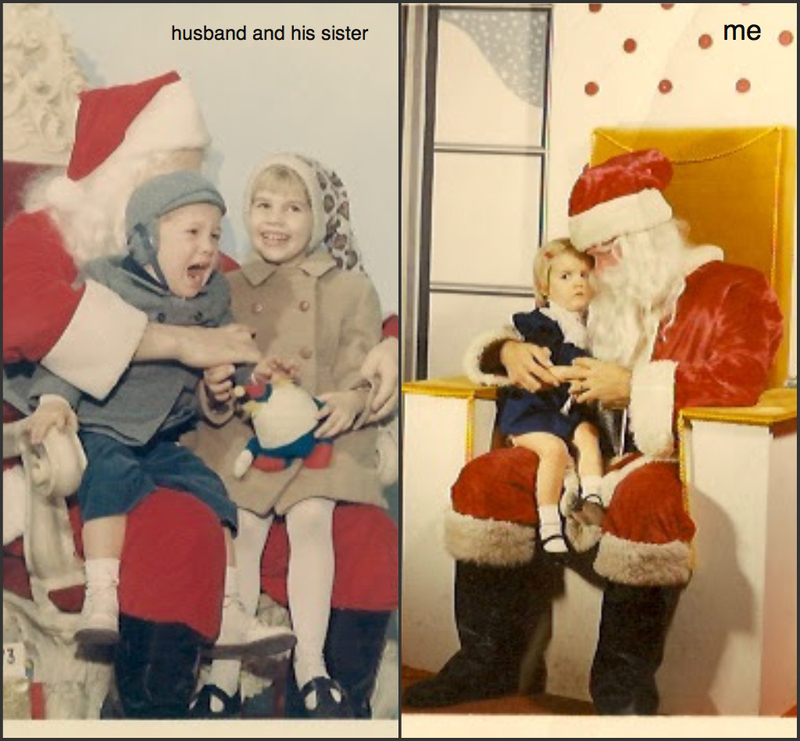 Cute post...some American holiday traditions are ridiculous! This is really funny, I have maybe one picture of my girls where they are both smiling and both look happy otherwise they both look terrible unhappy...really whats the point? Cute post. I had to laugh, so funny! 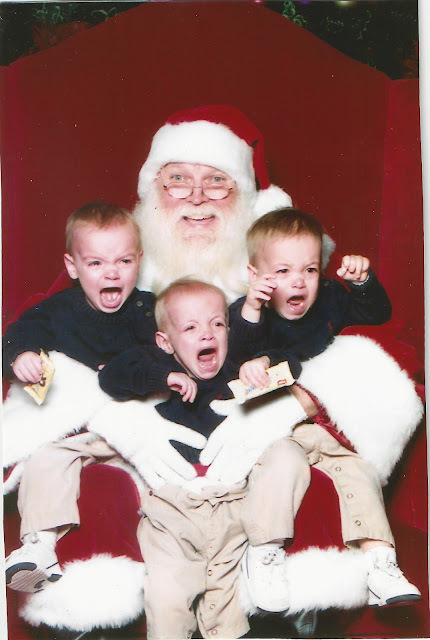 These images are too funny...adore the triplets!! I just spewed hot tea all over my 'puter screen...I am loving this post!! !